Native to the desert southwest, the coyote (also called prairie wolf) now ranges from Alaska, throughout most of Canada and the USA, and south to central America. The coyote mates for life. Breeding occurs in early spring. A litter of 5-10 pups are born after a 60-65 day gestation period. The male tends to the female during her late pregnancy and while she stays with the pups in the den until their eyes open (about 10-12 days after birth). Both parents spend the first summer teaching the pups basic hunting and survival skills and by late summer or early fall the litter begins to disperse and go their own way. 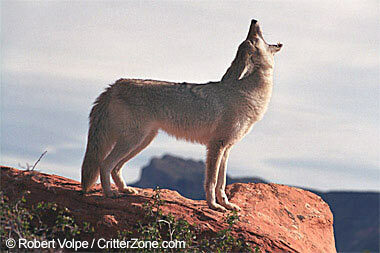 Coyotes are very intelligent, have excellent vision and sense of smell, and can attain a speed of 40 mph. They are skilled hunters - in summer feeding on small game and rodents, in winter banding in packs to hunt larger game such as deer and elk. One of the most adaptable animals in the world, the coyote will change its diet and breeding habits to accommodate the changing environment. The coyote's ability to live in close proximity to humans insures their survival in the America's. 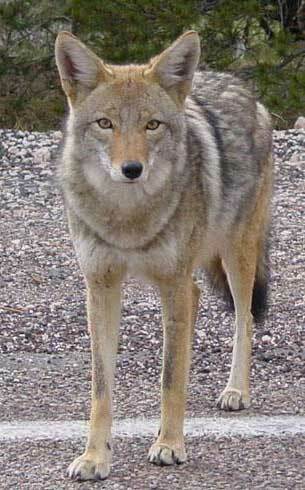 Coyote standing along roadside; photo by Marya on Wikipedia (use permitted with attribution).